Bemidji and Moorhead have already locked up for two ties this season and now could meet in the Section 8AA final (Photo by Tim Kolehmainen). In last winter's Section 8AA playoffs, Bemidji and St. Cloud Tech played a marathon six-overtime game that shattered several records for longevity. The Lumberjacks might want to prepare for a similar fate this year. Bemidji (21-2-2) earned the top seed in the Section 8AA playoffs with a perfect 6-0-2 mark against section opponents. But it was the two ties -- both against No. 2 Moorhead (14-7-2) -- that have fans discussing the likelihood of another lengthy showdown should the two favored teams meet in the final Wednesday, March 2. "It's two evenly matched teams going back-and-forth," Bemidji coach Wade Chiodo said after the first meeting on Dec. 9. One hundred and eighteen minutes of stalemate hockey between the top two seeds indicate how closely matched they are. Bemidji is a stingy defensive team that allows only 1.68 goals per game, powered by goaltender Jeremiah Graves (17-2-2, 1.68, .928). The Spuds also feature one of the best goaltenders in the state in Michael Bitzer (14-7-2, 2.15, .929) and allow just 2.22 goals per game. In the two head-to-head meetings, the teams scored just six total goals. "I like playing the physical, in-your-face style," Chiodo said. "Don't give them any room. I preach that pretty hard." 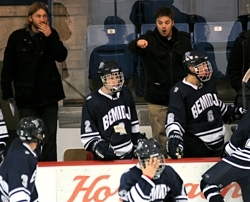 Bemidji's coaching staff has helped the Lumberjacks earn the No. 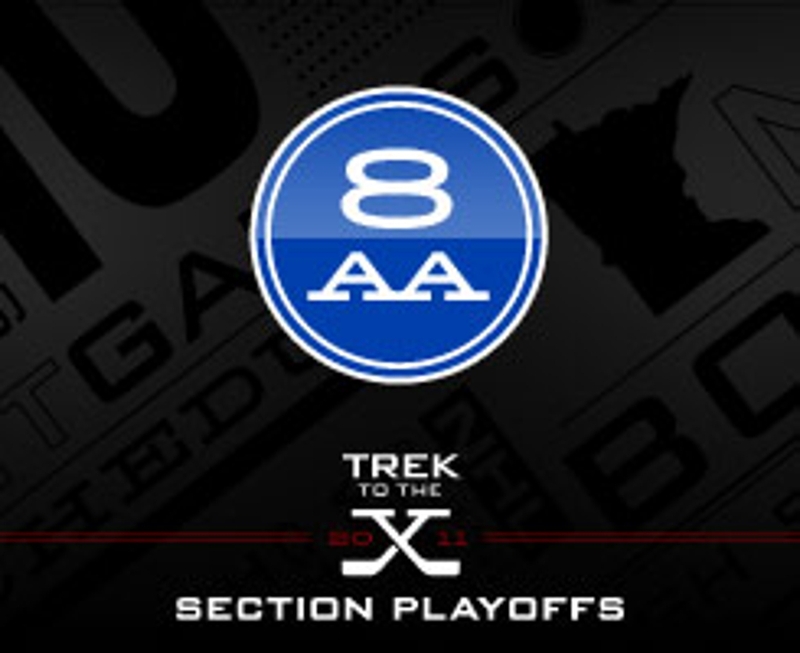 1 seed in 8AA (Photo by Tim Kolehmainen). The Lumberjacks have balanced scoring, with six players scoring double-digit goals and 15 who have lit the lamp at least once. Max Hazelton (18-15-33), Steven Heller (16-16-32) and sophomore Matt Serratore (15-17-32), the son of Bemidji State coach Tom Serratore, lead the way up front, although seven players are within seven points of the scoring lead. "He's only a sophomore, but he might be the smartest hockey player that I've had a chance to coach," Chiodo said. Moorhead isn't as high-powered an offense, with just three players sharing the team lead with 11 goals: Bryant Christian (11-18-29), Eric Brenk (11-9-20) and Logan Ness (11-8-19). But the Spuds have received goals from 17 varsity players and have 10 players in double-digit points. One point in Moorhead's favor is that no one other than the Spuds and No. 3 Roseau (11-13-0) has represented the section at state since 1996. Should the favorites meet in the final, pack a lunch, a dinner, and perhaps even a breakfast. But don't count out the other top seeds, such as Roseau, No. 4 Brainerd (18-7-0) and No. 5 St. Cloud Tech (15-9-1), each of whom could pull off a playoff upset or two. Roseau has suffered through a few injuries up front, but appears healthy for the stretch run. The Rams' Shane Omdahl (21-19-40) is a strong leader and playmaker who had a taste of state tournament hockey last winter. Brainerd has a high-scoring front line of Mr. Hockey finalist Josh Archibald (27-46-73), Mitch McLain (33-28-61) and Matt Pohlkamp (30-28-58) that can carry a team. St. Cloud Tech has played the other top seeds tough and have veteran Al Patten (15-9-1, 2.34, .920) between the pipes. He played every second of that six-overtime marathon victory over Bemidji last season. Even No. 6 Monticello/Annandale/Maple Lake (12-12-1) has played tough recently and features one of the state's best juniors in Gage Torrel (26-24-50). It would be bucking recent -- and past -- history to pick anyone other than Roseau or Moorhead for the favorite's role. The two powerhouses have combined for the past 14 section titles. And with Roseau hovering around .500, that leaves the Spuds to pick up the spotlight. Moorhead is seeded No. 2 behind Bemidji, a team it tied twice during the regular season. A trip to No. 3 Roseau certainly won't be easy for the No. 6 Moose, but this isn't a typical season for either program. Roseau has had its struggles while Monticello/Annandale/Maple Lake showed it can play with the top dogs in a 2-1 loss at Hermantown just two weeks ago. Don't dismiss the impact a top player such as Gage Torrel can have, either.